"The problem with bottled sauces and marinades is that the only words you recognize on the ingredients list are ‘high fructose corn syrup,' and ‘dehydrated garlic.' Hopefully, you will see just how simple this sauce is to make. Not only is it MSG-free, but the flavor is far superior to any of those supermarket bottles." Whisk orange juice, brown sugar, rice vinegar, soy sauce, chile paste, fish sauce, and garlic in a large bowl. Add skirt steak and marinate for 15 minutes. Cook steaks on the preheated grill until they are browned and are hot and slightly pink in the center, about 4 minutes per side. An instant-read thermometer inserted into the center should read 140 degrees F (60 degrees C). 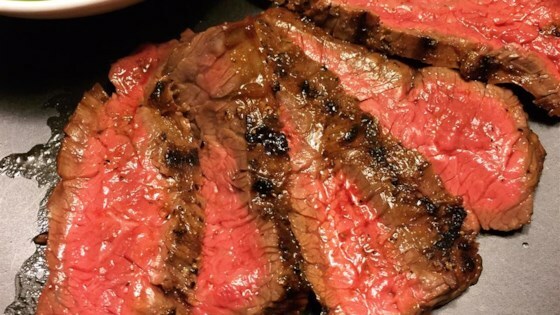 Skirt steak doesn't need to marinate for longer than 15 minutes because of how thin the meat is. May substitute additional soy sauce for fish sauce. Cooked under the broiler. Delicious and a hit. My husband and I thought this was one of the best steak dinners we have ever had at home! I marinaded about an hour and the steak was so tender and the flavor was amazing. Thanks Chef John!